Television presenter David Starkey is set to unveil a rare royal portrait at Hever Castle in March. The Tudor historian will unveil the 16th century portrait of Henry VIII's mother, Elizabeth of York, which will mark the start of Hever Castle's celebrations of the 500th anniversary of the famous monarch's accession to the throne on March 13. A spokesman for Hever Castle said: "The portrait will form part of the Henry VIII: The Pampered Prince exhibition, which will provide an insight into a mother who spoiled and doted on her son, which had a great affect in shaping Henry VIII, famous for his pursuit of fame, indulgence and women." Visitors will also see a representation of the complete collection of portraits of the six wives of King Henry VIII. Hever Castle re-opens on March 1 and is open Wednesdays to Sundays. 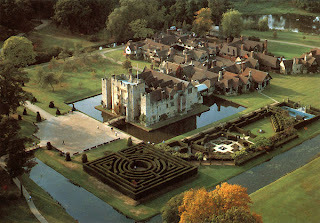 Wow, what I wouldn't give to pay a visit to Hever Castle! If only I could come into a large inheritance, quit my job, and go see this exhibit... I would pick y'all up and take me with you. Interesting! Wouldn't I love to see it in person! Dar & Susan: you and me both! LH: awww...I'd do the same too! Wouldn't that just be so fun...all of us history lovers to travel together! Oh, I'd love to go! It sounds so detailed. Can you imagine seeing all that?